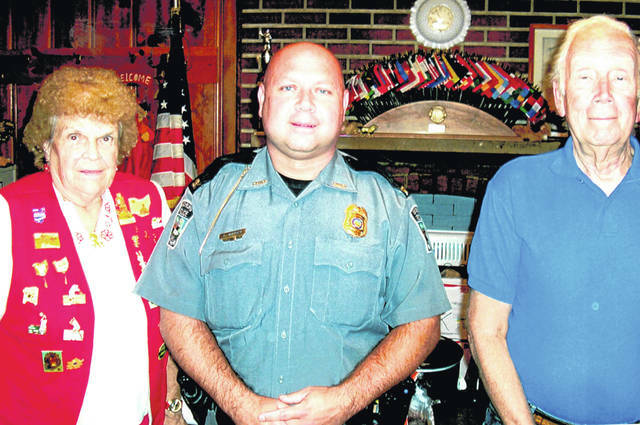 The Lynchburg Lions Club held its monthly dinner meeting Sept. 10 at the Lions Club Building. The speaker for the dinner meeting, always accompanied by an educational program, was Lynchburg Police Chief Richard Warner. He discussed the duties of local police and various types of crime and day-to-day situations that arise in a small town. Warner has previously served as Highland County sheriff and has many years of detective work experience. Pictured, from left, are Lion Janet Florence, Warner and Lion Bob Roth. https://www.timesgazette.com/wp-content/uploads/sites/33/2018/09/web1_Lynchburg-Lions.jpgThe Lynchburg Lions Club held its monthly dinner meeting Sept. 10 at the Lions Club Building. The speaker for the dinner meeting, always accompanied by an educational program, was Lynchburg Police Chief Richard Warner. He discussed the duties of local police and various types of crime and day-to-day situations that arise in a small town. Warner has previously served as Highland County sheriff and has many years of detective work experience. Pictured, from left, are Lion Janet Florence, Warner and Lion Bob Roth.